I went back to the Red Elm Café to visit with an old friend and now a new friend. While there I noticed this terrific artwork on the wall of the Basket Nook On MLK Way between South 10th and South 11th. I suspect that the art is temporary until somebody develops the lot and considering the good things that are happening I’m guessing new construction will happen sooner than later. But for now I’m enjoying it. This entry was posted in Art -- there is art here!, Tacoma, Their future is in question, WA State - Pierce County and tagged art, graffiti, Hilltop, lot, paint, redevelopment, Street Art, vacant on July 22, 2017 by admin. The new place of the day is the parking lot next to the old Elks Club. The parking lot itself is poorly maintained with weeds and broken glass. When I drove past, I saw that art had occurred twice! 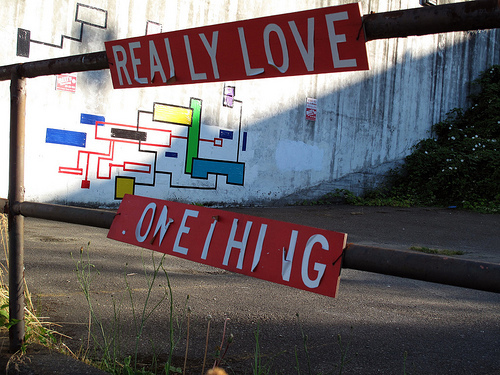 There is a great sign that says Really Love Something and colorful tape art on the side of the building. This entry was posted in Art -- there is art here!, Tacoma, WA State - Pierce County and tagged Elks, parking lot, Really Love Something, sign, Street Art, tape on July 22, 2011 by admin.